"In order to function properly, proteins fold into very precise structures, but environmental stress or pathogenic mutations can cause proteins to misfold and aggregate," said Xin Zhang, assistant professor of chemistry and of biochemistry and molecular biology at Penn State and leader of the research team. "Protein aggregation is a multi-step process, and it is believed that the intermediate form, which previous imaging techniques could not detect, is responsible for a number of diseases, including Alzheimer's, Parkinson's, Type 2 Diabetes, and cystic fibrosis. We developed the Aggregation Tag method—AggTag—to see these previously undetectable intermediates—soluble oligomers—as well the final aggregates in live cells." Previous techniques to identify protein aggregation used fluorescent compounds that were always lit up, which made it impossible to distinguish properly folded proteins from the intermediate form because both trigger low-level diffuse fluorescence. The AggTag method uses "turn-on fluorescence," so the compound only lights up when misfolding starts to occur. "When the fluorescent compound has plenty of space to move, it rotates freely and remains turned off, as in the presence of a properly folded protein," said Yu Liu, assistant research professor of chemistry at Penn State and the key developer of AggTag method. "But when the protein starts to misfold and aggregate, the compound's movement becomes restricted and it begins to light up. Diffuse fluorescence indicates that intermediate oligomers are present, while small points of brighter fluorescence indicate that the denser insoluble aggregates are present." "We plan to continue developing this method so that we can signal the transition of oligomers into insoluble aggregates using a color change," said Zhang. 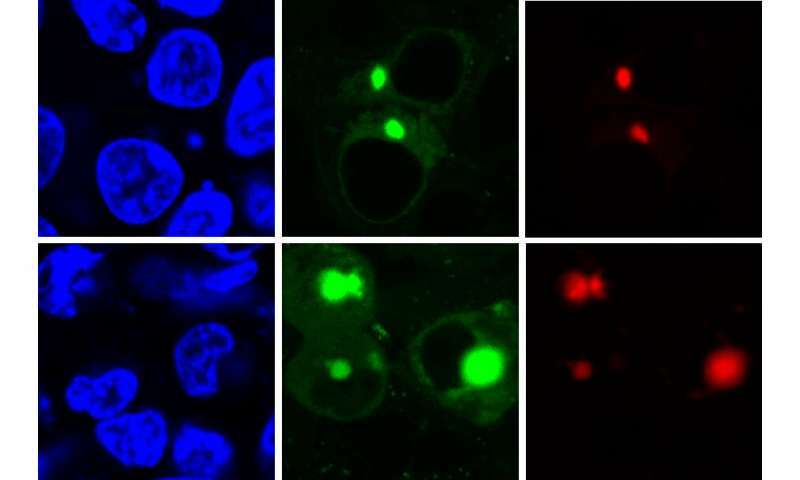 "This method provides a new toolbox to study protein aggregation, which is currently a highly studied topic among scientists. Hopefully this will allow us to better understand the entire process of protein aggregation and the role of each of these forms in the progression of neurodegenerative and other diseases."